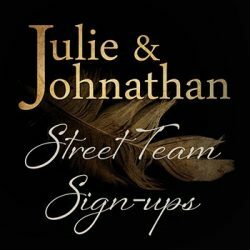 As you know from the videos we’ve posted, Johnathan and Julie are now writing partners. Not just for TV/Movie scripts, but for books too! And we’ve got lots of books coming in 2018. So we’re on the hunt for the best book bloggers in the business who would like to get to know us better and help us spread new release alerts out to readers on the internet. We are only looking for book bloggers and consistent Goodreads Reviewers at this time. If you’re not a book blogger there will be another form in early January 2018 for ARC readers and you can apply for that then. If you are a book blogger/Goodreads Reviewer and would like to join our new street team just fill out the form HERE. All fields are required. We are looking for people who review often and in specific places. You don’t need to post your review at Amazon (I know some bloggers have lost that opportunity) but you have to post them somewhere. Once we’ve gotten our team together we’ll notify you by email and send you an invitation to join our secret Facebook group. THANKS SO MUCH for your interest and we’ll talk soon!